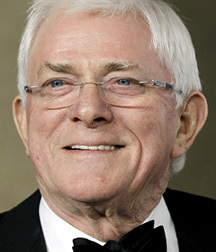 Born in Cleveland, Ohio, Phil Donahue spent a decade as a Dayton, Ohio reporter and radio interviewer of such notables as John F. Kennedy and Malcolm X before creating the innovative The Phil Donahue Show, which often focused on topics dividing liberals and conservatives in America and was the first TV talk show to incorporate audience participation. On national American television for 29 years, The Phil Donahue Show remains the longest continuous run of any syndicated TV talk show in U.S. history. During his career, Phil Donahue garnered 20 Emmy Awards, 10 for Outstanding Talk Show Host, and 10 for The Phil Donahue Show. He received a Peabody Award in 1980, and was inducted into the Academy of Television Arts and Sciences Hall of Fame in 1993. In July 2002, after seven years of retirement, Phil Donahue returned to the air with Donahue on MSNBC only to have the show cancelled in February 2003 because of Donahue’s public opposition to the U.S. invasion of Iraq.